Now that I got that out of the way......welcome to the all-you-need-to-know guide to living in the Ballard neighborhood Seattle. 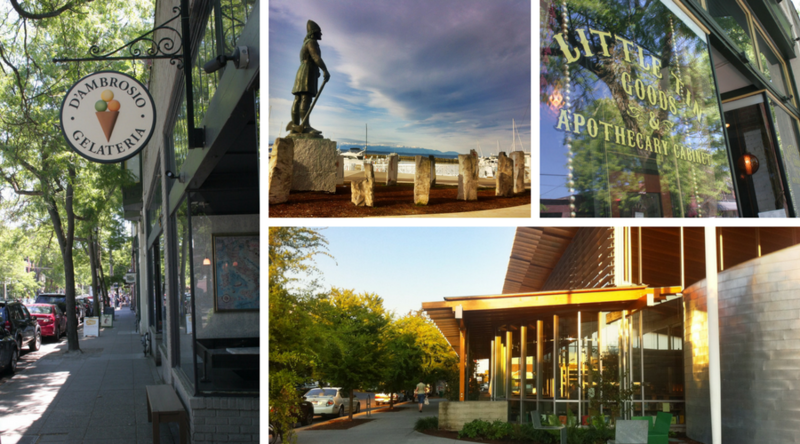 Ballard is one of Seattle's most sought-after areas and has been booming in recent years. Here you can learn about Ballard's history, its exceptional outdoor spaces, its exceptional indoor spaces for dining and entertainment, learn about schools in Ballard and of course, all things Ballard real estate. Basically what makes it so great about living in this Seattle neighborhood. Ballard Seattle is located NW of downtown Seattle in a beautiful setting with water on two sides. The stunning Puget Sound (Salish Sea) and the Olympic Mountains lie to the west and to the south, Salmon Bay where the fresh waters of Lake Washington meet salty seawater at the Ballard Locks. The Magnolia neighborhood lies to the south, with North Beach / Crown Hill sit to the north, with Greenwood / Phinney Ridge neighborhoods to the east. A brief history of Ballard Seattle. Allegedly (it's hard to believe these days), the Ballard neighborhood Seattle, was once a sleepy fishing village, with Norwegian leanings. It's now a bustling, hip neighborhood while still retaining some of its Scandinavian heritage. Ballard was incorporated as a city in 1890 and was annexed to Seattle in 1906. The thriving fisheries and timber industry attracted a lot of Scandinavians, particularly Norwegians to the area who made up one-third of the Ballard populace at their peak and have had a strong influence on the community. You'll still see plenty of Ballard homes flying Norwegian and Swedish flags and with each one gently ribbing the other. It became the self-proclaimed "Shingle Capitol of The World" when it produced 322 million wooden shingles in 1898. Sure beats being the shingles (viral variety) capital of the world I suppose. In 1917, the famous Ship Canal between Lake Washington and the Puget Sound opened. Officially known as the Hiram Chittenden Locks, but usually just called Ballard Locks or The Locks for short, it's a great place to visit. Despite the current economic and building boom, Ballard still retains some of its past including the industrial area on Salmon Bay. The preserved Ballard Old Town along Ballard Avenue is where dive bars that once used service thirsty fisherman, have been replaced with fancier, more "civilized" establishments. One man's civility is potentially another man's boredom. Every week it seems like a new business opens and one fades away, which is not always a great thing. R.I.P The People's Pub (2017) and The Viking Pub (2013). Living in the Ballard neighborhood Seattle. Ballard Seattle is a great combination of low-density, quiet leafy streets, high-density living, a bustling Old Town center plus some great outdoor spaces to escape to. You can have quiet solitude or you can have bustling humanity all within easy access, depending on what your personal preference may be. Ballard feels completely self-contained and has everything you need without having to jump in a car to get it. Sure, it's nice to have downtown Seattle just 15 minutes away but when you live in Ballard, the urge to go there is not as strong. Ballard's got it all. The main hub of human activity in Ballard occurs along Market Street and on Ballard Avenue, aka Ballard Old Town. Here you will find a smorgasbord of stores, cafes full of caffeinated quick in-and-outers and lethargic laptop surfers hogging the tables, top rated and non-rated restaurants, chi-chi bars with overpriced cocktails and dive bars with strong house-pours, a plethora of craft breweries, places to get tattoos and piercings, specialty stores with nick-knacks to browse, record stores (vinyl is back! ), beautiful people who fell out of fashion magazines, regular people and homeless people, more bars than you can shake a drunken fist at, live music venues......and ALWAYS some new business with a poster in the windows proclaiming "Opening Soon!" And of course Ballard currently has a whopping 10+ microbreweries, apologies, I mean craft beer breweries! It's veritable mecca for craft brew lovers. Throw in a food truck outside and you'll be in beer-munchies Nirvana! Just don't ask for a Bud Lite! Here are a few Ballard establishments to check out, but the list goes well beyond these few samplings. If you're in the mood for some good restaurants in Ballard, check out The Walrus and Carpenter famed for its oyster and magazine write-ups, Voltarra for great Italian food, La Carta de Oaxaca for great Mexican food or The Bastille for French and pub food (make sure to check out the unique bar at the back) and Jhanjay Vegetarian Thai Cuisine (self explanatory name). And if you're in the mood for a good burger and fries and a beer in a light challenged old bar, then check out Hattie's Hat. Cocktails: for some great cocktails check out Grog at the back of Ballard Annex Oyster House or try small and welcoming Hazlewood with an upstairs hideaway or Percy's & Co. for in-house infused libations (and great food too). Bars in Ballard Seattle: alas, Ballard lost a few of its classic old pubs to the relentless advancement that comes with a booming city like Seattle. However, these are still a few not overly sophisticated bars to relax in and enjoy a good pint of local brew. One of my favorites is Olaf's on 24th. Good house pours. Hattie Hat on Ballard Avenue (see above) is fortunately still with us. Another good pub is Kings Hardware where you can get your haircut next door at Rudy's after you've built up some Dutch courage for that new hairstyle! Also, there Olaf's bar on 24th Ave NW for some pinball and famous interior doorway. The Ballard neighborhood is a major Seattle hub for microbreweries, or should I say craft breweries. If you can't find a good ber on Ballard then you probably don't know what a good beer is! There's the Maritime Pacific Brewery (aka Jolly Roger), Stoup Brewing and Peddler Brewing for the peddled powered bikers out there. For the coffee addicted: it's OK, you're in Seattle now and not far from a fix. Well obviously, Ballard has a Starbucks or two. For a local alternative try Cafe Fiore on Leary Ave NW or Bauhaus Strong Coffee or Ship and Ship where you have a coffee while also availing of mailing services. Ballard's location right on the edge of the Puget Sound makes for a great setting for enjoying the outdoors. The Ballard Locks, (see photo at top of the page), also formerly known as the Hiram Chittenden Locks, is where the elevated fresh waters Lake Washington meet the salty waters of the Puget Sound. Big boars and small are lifted or dropped to navigate between the two. Also, you can watch wild salmon migrating upstream. How many big cities in the world can you do that? A great place to hang out and get lots of tourists visiting. 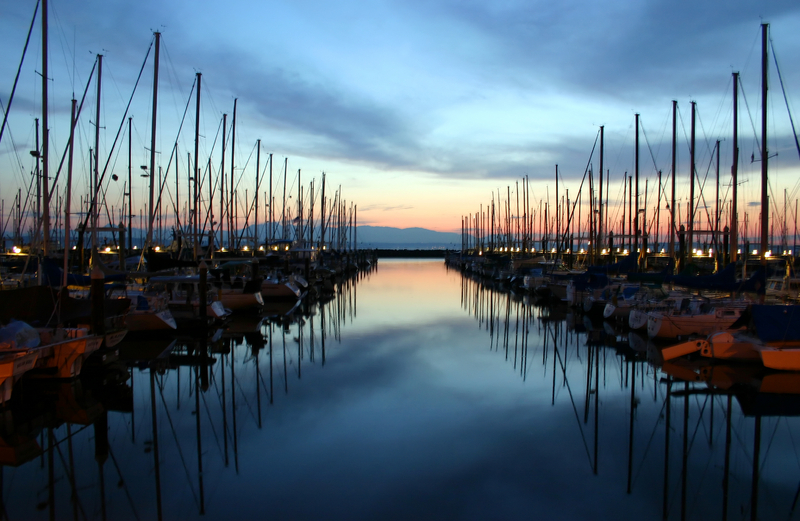 Shilshole Marina: makes for a nice stroll along the waterfront as you gaze at hundreds of moored boats and yachts of varying sized and price tags. Also, there's a sizable number of people who live on their boats. The ropes constantly tapping off the rigging would keep me awake all night! If you're of the boating persuasion here's some additional information on Shilshole Marina. Golden Gardens: if you continue past Shilshole Marina and right at the end of the Burke Gilman train you will hit Golden Gardens, one of my favorite places in Seattle. It's got a lovely sandy beach, volleyball nets, fire pits, BBQ and picnic tables, swings for the kids and of course... those magnificent views of the Puget Sound and the Olympic Mountains with spectacular sunsets. It's a great mix of humanity that will vary over the course of the day. It can get busy on those warm summer days but you can usually still find some quiet spot. Sunset Park: this is just a small grassy area on 32nd Ave NW and 77th. Perched at the top of a cliff that looks down over Shilshole Marina, it's a great gathering spot for watching the sun go down over the Olympics. As the sunset approaches, local and their dogs, will start to gather to take in the views. Bring your camera! Because Ballard is such a great neighborhood to live in, the Ballard real estate market is one of the most competitive. 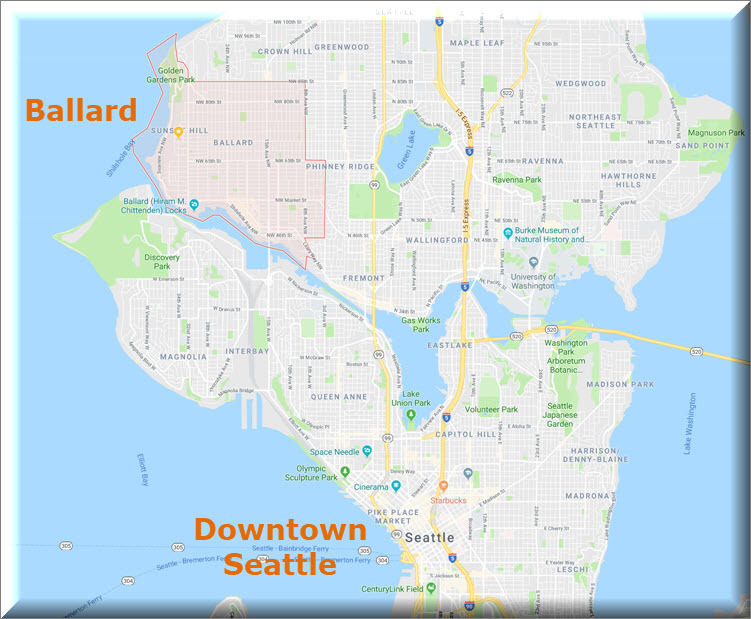 Ballard real estate can be approximately divided between homes located above and below NW 65th st where the zoning changes from single family to the north and multifamily to the south. The area north of 65th is made up primarily of single-family homes on quiet residential streets with lots of older homes including red brick Tudors, Craftsman, Bungalows, ramblers, and other home styles. Also, there's an increasing number of big boxy million dollar new homes that replace some of the older homes. Land is valuable and developers will use every square foot of it. South of NW 65th Street, the density increases and most of the homes are townhomes, condos, and apartments. Ballard Seattle real estate has seen an explosion in new construction in the past 10 years. Some sections of 24th Ave and Market street are unrecognizable from just a few years ago. In this area, you don't need a car and stroll a few blocks to Ballard's social hubs. The trend below shows how Ballard home prices (median) have varied since 2006. Shows data for both single-family homes and Ballard condos. All data is via the NWMLS. Ballard has some top-rated schools that make it a great place to live for young families. The map below shows the location of various schools in Ballard. Click on the map for more information on each school. Ballard Chamber of Commerce (Ballard Alliance). Yelp's guide to Ballard restaurants. Location of craft breweries in Ballard. Just don't call them microbreweries! Ballard Farmers Market every Sunday.